Accessibility: Wheelchair accessible. No ASL interpretation. Scent free environment. We - Vanessa and Tami - are coming back from our tour! 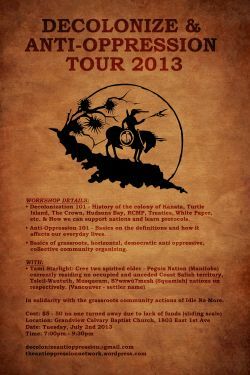 Through tons of unceded and occupied territories, facilitating workshops and film discussions. Decolonization and Anti Oppression (intersectionality) work. Report back from our coast to coast tour. Discussion about colonization from an indigenous context within Canada. Anti Oppression terminology investigation and how to organize in a good way with nations. Wheelchair accessible. No ASL translation. Please leave your scents/perfumes at home = scent free event. This space is also safer space - anti oppressive.